Following on from the fuel crisis of the 1970s, Volkswagen had developed its new generation of water-cooled cars with the optimisation of performance and economy at the forefront of its engineering processes. Formel E (‘E’ for economy) was introduced as concept that made ‘possible the ultra-economical’ use of fuel to drive a car.’ With the exception of the Scirocco (seen as too sporty to receive an economical badge, long before the Scirocco TDI appeared), every model in VW’s new range of cars was to have a Formel E variant. And while they cost more than regular models, the additional outlay was said to be offset by cheaper fuel costs. It was November 1980 before a new version of Volkswagen’s then five-year old Mk 1 Polo was to wear the new fuel-saving moniker. While fuel consumption was hardly dire with the standard 895cc car typically returning 40mpg on the combined cycle, the new Polo Formel E promised even more economical motoring with a high specification. Just as the LS and GLS Polos of the time, the Polo Formel E was equipped with a 1,093cc 50bhp engine. For super-economical duties, though, the unit was given a high compression ratio of 9.7:1. Torque was 60lb ft @ 3,400rpm, while peak power was reached at 5,400rpm. Special features of the Polo Formel E included a 3+E gearbox, the ‘fourth’/top ‘E’ speed being an extra-long ratio for cruising. Maximum speed was reached in third gear, so the extra ratio was purely for lowering the engine speed and using less fuel. Who would have thought that would catch on? A yellow gear shift LED lamp was fitted which illuminated when it was necessary to change gear for optimum economy, and a fuel consumption indicator informed of the car’s fuel economy at any particular time in either mpg or l/100km. Formel E cars also proclaimed their parsimonious nature by a small silver ‘Formel E’ badge on the boot. 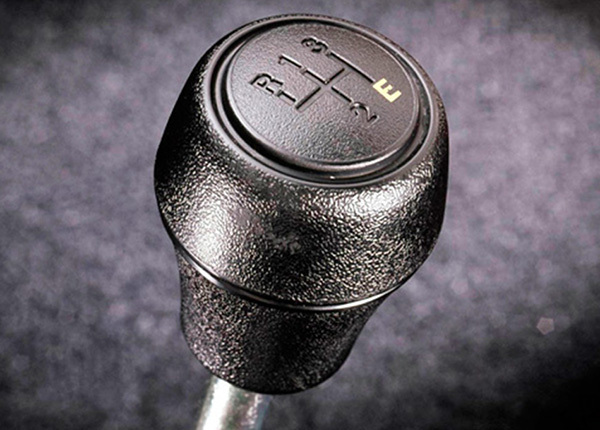 Even by ignoring the gear shift indicator, the Polo Formel E was claimed to present a 25.3 per cent fuel saving when compared to the standard 1093cc model on which it was based. This figure rose to 36 per cent when drivers chose to obey the dashboard tell-tale shift light. The Polo Formel E was capable of 40.4mpg on the urban cycle, compared to 29.7mpg produced by the non-economy measure-equipped car. At 56mph in fourth (top) gear, the regular 1.1-litre Polo achieved 44.1mpg. At the same speed, in its super-economy ‘E’ gear, the Formel E went some 11.3mpg better. There were caveats, though – Volkswagen’s claimed ‘factory tested’ figures were based on urban driving conditions. Even so, economical leanings didn’t necessarily mean cuts in performance. With only 50bhp, the Polo Formel E was no ball of fire (and would never be), but posting the same 90.1mph top speed and 15.4-second 0-60mph time as the standard 1.1-litre Polo showed that performance needn’t be cut at the expense of economy. 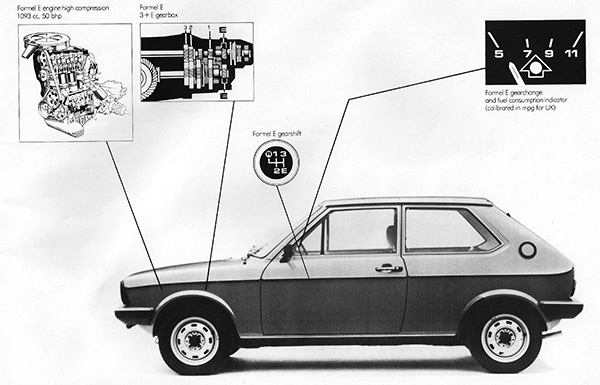 Official fuel consumption figures of 1981 which used the Passenger Car Fuel Consumption Order of 1977 data workings quoted the Polo Formel E as delivering 41.7mpg (or 6.8l/100km), even when at 75mph. Naturally being the smallest Volkswagen, the Polo was also the most economical Formel E model, but the Golf Formel E came very close, and was further equipped with aerodynamic A-pillar covers and a lower front spoiler. Its saloon sister, the Jetta, also featured a prominent boot spoiler mounted along the trailing edge or the car. Sadly, the Formel E concept came a little too late in the lifespan of the Mk 1 Polo. Sold in Germany based on the Polo GLS, the Polo Formel E appeared on the UK market in very few numbers as a run-out special edition LX model in the autumn of 1981. Based on the basic N version with no external chrome trim, the LX was only available in Diamond Silver and Regatta Blue metallic paint finishes. Unique features included a laminated windscreen, silver-painted dashboard, H4 halogen headlamps, polished chrome hubcaps and wider 155/70 tyres. Special ‘LX’ waistline graphics and trim were applied to the body sides and front wings. In September 1981, the 685kg Polo LX Formel E’s price in the UK was £3,799.80 including VAT.